A Ladder War match for the Tag Team titles has been confirmed for next month's Final Battle pay-per-view. 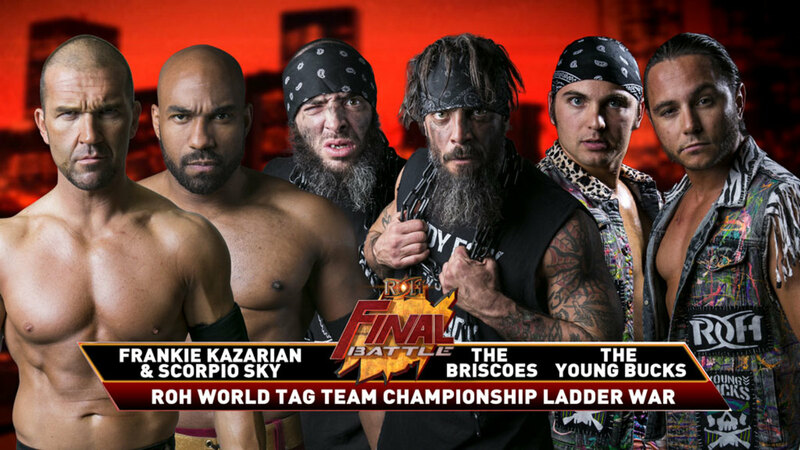 On this week's episode of Ring of Honor television, The Young Bucks faced The Briscoes in a match to determine which team would challenge for SoCal Uncensored's (Scorpio Sky & Frankie Kazarian) Tag Team titles at Final Battle. After the match ended in a double disqualification, Sky & Kazarian came out and set up them defending their titles against both The Young Bucks and The Briscoes in a triple threat Ladder War at Final Battle. In the most recent Ladder War match, The Young Bucks defeated Kazarian & Christopher Daniels and Motor City Machine Guns at All Star Extravaganza VIII in 2016.